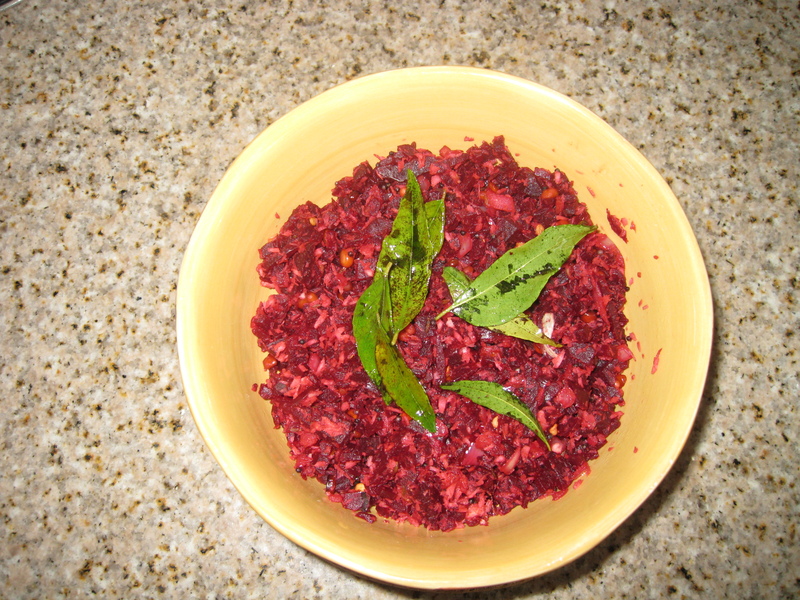 Poriyal, a south Indian side dish is usually made from cabbagge, beetroot, carrot, beans or any other vegetables like raw papaya or leafy vegetables or even with chow-chow. In this recipe beetroot is used as a main ingredient. 1. Pressure cook whole beetroot. Let it cool, peel the skin and chop finely. 3. Crush garlic, jeera, red chilli powder and coconut. 4. Heat 1 teaspoon oil in a pan. 5. Add mustard seeds, urad dal, channa dal, curry leaves. Saute till mustard seeds start to crackle. 6. Add chopped onions, saute till transperent. 8. Add salt, cook till dry. 9. Add the crushed garlic, jeera, coconut mixture. 10. Cover and cook for 1 minute. 11. Garnish with fried curry leaves.